Stay away from Instagram on Election Day -- at least until you've finished voting. A group of New Yorkers is making headlines today after suing the state of New York over this strange law that prohibits voters from showing their completed ballots to anyone else, like sharing it on social media, for instance. According to the New York Daily News, the lawsuit argues that the existing statue violates New Yorkers' constitutional right to free speech. 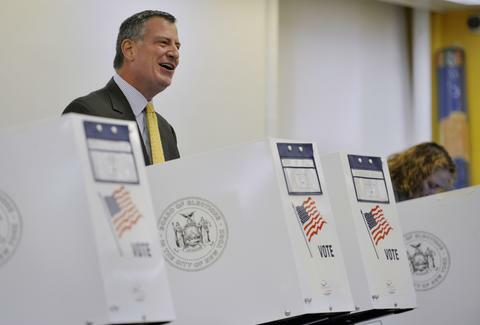 Apparently, New Yorkers are not alone in this struggle against voter-selfie oppression. A bunch of other states have similar restrictions -- as Justin Timberlake apparently found out after posting an offending Instagram from his early-polling place in Tennessee. The Associated Press recently published a state-by-state breakdown of the pertinent regulations. If the New York lawsuit prevails, then perhaps future voters can express their civic pride in the contemporary electronic fashion. But until then, you'll just have to make do with that antiquated "I Voted" sticker. UPDATE: A federal judge in Manhattan has upheld New York's existing selfie ban, writing in a 16-page decision that changing the rules so close to election day would be "a recipe for delays and a disorderly election." Chris Shott is Thrillist's Senior New York Editor. He never takes selfies. Follow him on Twitter and Instagram.